The shoe was very comfortable that it felt like a slipper, according to a reviewer. The Parkclaw 275 GTX was easy to wear and take off, attested numerous users. Many wearers enjoyed the spacious toe box of the Parkclaw 275 GTX. Several buyers claimed the sizing of the shoe was accurate. The outsole performed exceptionally on soft terrain, said a runner. Another said they were impressed with the outsole’s sticky grip. One user experienced discomfort as the shoe did not fit them properly. The Inov-8 Parkclaw 275 GTX was, favorably, a surprising performer. Runners appreciated the versatility of the shoe, which allowed them to navigate between pavement and trail with almost-to-no problem. Many users found themselves recommending the shoe, especially to those who are marathon-inclined. Ultimately, the Parkclaw 275 GTX did a fantastic job in being a reliable shoe on both road and trail. I've had a long-standing fascination with Inov-8 as a brand and company. Well, "long-standing" is relative given the company's short history of less than 15 years. I first purchased an Inov-8 product – a 12-liter back-pack – in 2010 when I was contemplating run-commuting. The back-pack was well designed, keenly priced, and remains a favorite kit item to this day. It was then a couple of years after that I first came across their running shoes and then another couple of years after that that I mustered up the courage to try them. You see, their shoes looked so damn intimidating, with their aggressive grip, slim and low profile, and overall "ready for business" look about them, not to mention their focus on off-road running (at a time when I was happy to just run around neighborhood blocks). Even the model names were intimidating – Mudclaw, X-Talon, Terraclaw – all followed by a 3-digit suffix, like a secret code of sorts. As I later learned, the numbers simply denominated the weight of the shoe (in grams) and I wasn't wrong to feel intimidated, since the bulk of their range had minimal cushioning and low drops of 3-6mm, thereby catering to the more experienced, efficient and nimble-footed runners. All suited, of course, for rugged, technical and inhospitable terrain that these shoes were designed for. You see, the British-founded company is based in Cumbria, near the Lake District with its glacier-carved hills and valleys that is also the home of British fell-running (extreme hill running, often in mist, horizontal rain, and freezing temperatures). Although now owned by Japan's Descente since 2015, little seems changed. The shoes still have names like Mudclaw, Trailtalon and X-claw and still feature 3-digit suffixes. The only discernible change is that the shoes now seem to cater to dry and rocky trails (read: America) more so than the traditional soft terrain in Britain, evidence of the company's more global outlook. The Parkclaw 275 GTX (which denominates the Gore-tex version) may also be a result of this new approach to open up a new audience, in this case, the part-time, casual, novice, or urban trail runner looking to mix-up tarmac and gentle trails. I was looking for a shoe for running predominantly in the British winter, which is cold and often wet, and suited for my typical long-slow distance route, which is a 50-50 mix of road and groomed trail, frequently along the Thames River. An ideal shoe would provide some protection against the elements, with enough cushioning for the road sections, and sufficient grip and traction for both wet tarmac and muddy (but not sloppy) trails. On paper, Parkclaw 275 GTX fulfilled my needs perfectly. Go up half size and watch the heel. In the intervening days before taking delivery of the shoes, however, I wondered if I chose wisely. According to Inov-8's fit scale which runs from 1 to 5, the forefoot volume of the Parkclaw is classified 5, which is equivalent to a 2E fitting. Being a D (standard, or 3 on the Inov-8 scale), I worried that 5 may be too wide. I also worried that I may have ordered the wrong size. I'm normally US 10.5 (which usually translate to UK 10.0 and EUR 44.5) but under Inov-8 sizing UK 10/EUR 44.5 is US11.0, so I went with that, wary that the shoes may come up big. But, once the shoes arrived, I was relieved to find that both forefoot volume and overall length were spot on thanks mainly to the great fit at mid-foot. In fact, I doubt that these are roomy enough for true 2E feet. And sizing-up by half on the US scale proved sound. The only problem was at the heel, particularly on the right foot where some slippage was noted. I wasn’t too concerned, however; my right heel is particularly narrow, making this a personal issue with some shoes. Quite often, the problem disappears after a few runs, once the shoe is "broken in" and becomes more flexible. And with Inov-8 having supplied an extra "heel loop" hole for the lace, a feature you see more typically on dedicated road shoes, the issue became a non-issue, but be wary if you have particularly narrow heels. The shoes, in a departure from previous models of Inov-8 I had come across, actually appeared "beefy" and robust. Imagine if you will a supportive high mileage daily trainer but with more "down to business" outsole, in this case with 4mm deep treads. On paper, the midsole stack is not that clunky at 12mm forefoot and 20mm rear, but they sure appear more "built" than any other Inov-8 shoe I've seen. The upper material is definitely more trail-orientated, with none of the airy mesh of road runners in sight, although this could simply be a function of the Gore-tex lining. Liberal labelling on the shoe made no secret of the fact that the shoe is laden with proprietary technology. It includes Powerflow+ midsole material (enhanced shock absorption and energy return), EHC (Enhanced Heel Cup), Tri-C outsole (made of 3 different compounds for optimizing grip versus durability), and Dynamic Fascia Band, which enhances the "windlass effect" (basically, promotes a more efficient gait). Add to this Gore-tex in the GTX model which, according to website blurb, is applied using Invisible-Fit, although how exactly this made the shoes feel or perform differently was lost on me, like much of the technology – the proof is, as they say, in the pudding. At any rate, on the feet, the shoes were comfortable enough that I didn’t think twice about spending a few hours in them for their maiden run. I set off on a favorite 16-mile route of mine, which takes in a stretch of the hard-packed tow-path on the Thames Path National Trail, then a section of the undulating and groomed dirt trail on Richmond Park, and on the home stretch the much hillier and muddier Wimbledon Common. The route requires almost 3 miles of running on sidewalk and road past the shops and residences of Putney to reach the Thames tow-path, and the same distance on way back, so this is an ideal test route for any door-to-trail shoe. The shoes performed as expected and as hoped. On tarmac, they were firm and responsive with the cushioning and rebound from Powerflow+ midsole much in evidence, although definitely on the firmer side compared to dedicated road shoes. On groomed trails the Parkclaw performed like a dream, providing just the right amount of grip and assuredness required. Even on moderately technical trails, the shoes – contrary to earlier fears, given the stack height – provided decent foot-feel, in fact rivaling many other moderately cushioned trail shoes. While running on the Thames Path stretch, I remembered back to the 100-mile ultra I completed in May 2017 (Centurion Thames Path 100) and thought these would be the ideal choice should I decide to take the challenge on again (in the non-Gore-tex version probably since the race is in May). Incidentally, I did the race in La Sportiva Helios SR, my review for which can be found here. Having put more than 100 miles on them since that initial long run, over varying distances in various weather conditions but always on mixed terrain, I concluded that the shoes are not at their best on tarmac, despite their purported versatility (the shoes can be found under both Road and Trail on Inov-8 website) – I found them firm but not responsive enough, possibly due to the 4mm lugs? But, despite that, or perhaps because of that, they are awesome on trails. To be fair, on tarmac I reckon they are still better than pretty much all my other trail shoes, with the exception of On Cloudventure. Once out on the trail, they are no doubt better than 100% of all my road shoes, and often better than many of my other trail shoes. While I wouldn’t necessarily wear these for running exclusively on the tarmac, I wouldn’t hesitate to wear them for any runs on trails, as long as they aren't too technical or quagmire muddy, and for any mixed routes which are 30% or more trail. As the term "door to trail" implies, these are what you would wear to go running primarily on trails. They are, however, not for the sloppy deep mud. For something better suited for such conditions, refer to my review of Salomon Speedcross 4 CS here. And I would always go with these if there is any remotest chance of rain/snow or moisture underfoot. While the thought of feet overheating due to the Gore-tex membrane did occur to me, in practice this never became an issue. Sure, this could be due to the colder temperatures, but I had chosen this model specifically for winter use. And the waterproofing worked so well that I found myself looking for wet grass to run through just so I could test their limits. (Besides, as every trail-runner knows, this is the best way of ridding the shoes of mud!) It's a wonderfully liberating feeling to run through wet grass and puddles knowing your feet will stay warm and dry. Oh, and don't expect the shoes to weigh exactly 275 grams (or equivalent in your size). In fact, due to the Gore-tex membrane, the shoes are going to come in about 10-15 grams heavier. In the case of my size 11, the Parkclaw came in at 323 grams versus the non-Gore-tex Trailroc 285, which weighed less at 315 grams. And as mentioned my advice regarding sizing would be to go up a half for US scales while sticking to your usual in the UK and EUR. A final minor point: given the intended nature of their use, at least for me, for darker winter months, it would have been good to have more reflective features on the shoe, which currently is limited to just the foot logo in the heels. But as said, it's a minor point and just underscores the fact I struggle to find anything really negative about Parkclaw. In conclusion, the Parkclaw 275 GTX is a versatile shoe well-suited for handling both road and moderate trail in wintry conditions, albeit with a definite bias towards the trail. It is an ideal door-to-trail shoe and has become my go-to shoe for my mixed-terrain long-slow runs for the next few months, at least until late Spring. The shoes excel in longer distances at a slower pace and are well-suited for a fall/winter ultra in moderate trails. Ultimately, these are trail shoes, designed and made by a company firmly rooted in the off-road. I received the shoes courtesy of RunRepeat in partnership with Inov-8. The initial pair arrived with a couple of minor cosmetic faults. I was however unsure whether I should raise the flag on this – not wanting to look a gift horse in the mouth etc – but in the end, decided to alert Inov-8 since that would be the fair thing to do. To my surprise, unsolicited, a replacement pair arrived the very next day, along with this explanation from Inov-8 Head of Production Control: "We take product quality very seriously and we do strenuous tests on all our products. The industry average for product failure is 1.5%, our failure rate is 0.93% for 2017. However, making shoes is a technical process because there are so many different components. We have produced over twenty thousand pairs of the new PARKCLAW GTX, unfortunately, one or two will slip through which don’t meet the standard that we expect." Needless to say, the replacement pair was immaculate. Kudos to Inov-8. It clearly is a company which cares about product standards and is willing to stand by its products. I am a 41-year-old runner, about 170 pounds and 6’ 1” tall. I race all distances, from 5ks to Marathons, and spend at least half of my year training for an upcoming marathon. The ParkClaw 275 GTX is created to be an all-weather, all-terrain running shoe. Out of the box, the first thing I noticed about the shoe was its rigidity. The shoe is very stiff, a little heavier (275grams/9.63oz. ), but fit true to expectations for my feet. The shoe’s stiffness was immediately noticeable upon first wear, and unfortunately, the arch support seemed to be a little misplaced, putting pressure on my arch rearward toward my heel. Otherwise, the shoe fits well, providing stable comfort and plenty of space for my forefoot, as well as tremendous no-slip shoelaces. Generally speaking, the ParkClaw 275 is a decent daily trainer. In recovery or easy paces, the shoe tends to present itself a little stiff and clunky. With the 8mm heel-to-toe drop and heavier lugs on the bottoms, it is a little too easy to lose good foot-strike form. The shoe does provide an extremely stable platform, however. I tested this shoe in the heart of winter, so the temps were often extremely low, as cold as 19°F (-7°C), but the ParkClaw 275 kept my feet cozy warm. Whether I was doing a slow neighborhood recovery run at an 11:30 pace, or a workout near a 7:00 average pace, these shoes performed well. After they broke in, it seemed the flexibility of the toe increased a bit, which was great. Additionally, the shoes are just lightweight and nimble enough to handle tricky technical trails. Their grip and traction are superb, providing a stable footfall no matter the terrain. In the mud and rain, or on frozen icy turf, this shoe conquered every element. Likewise, whether running on a concrete lane, an asphalt street, a grassy path, or a dirt trail, no terrain was off limits in the ParkClaw 275, whether uphill or downhill. On a few occasions, I found myself off-road in cold, wet conditions, my feet remained completely dry and warm, thanks to the GORE Invisible Fit Technology. The shoe almost feels like a mini rugged boot, protecting me from rocks and sticks, and whatever else may seek to puncture my feet. The outsole tread is aggressive and cushioned enough to handle unexpected stones and loose gravel so that no traction is lost. While running in these shoes, I did not lose my balance or fall one time, and I intentionally took them on extremely difficult trails. This shoe seems like it will last forever. After 90 miles on every kind of terrain, my ParkClaw 275s show very little wear and tear. The longer I wear them, the more flexible they become, which is an advantage. I estimate these shoes could last 1,000 miles. For a daily trainer in diverse environments that could withstand hundreds of miles, the ParkClaw 275 GTX is an outstanding choice. It is a little clunky and inflexible for speed, but this shoe is great for pounding through every kind of terrain and element. When I run in these shoes, I feel like there is no place I cannot go, so I do not have to worry about terrain or weather changes. Check out my video review here. Are the new Inov-8 Parkclaws a good place to park your claws? When I heard that Inov-8 were making the Parkclaws I was pretty excited. I have owned several pairs of Inov-8 shoes up to this point and for trail running they have been fantastic. 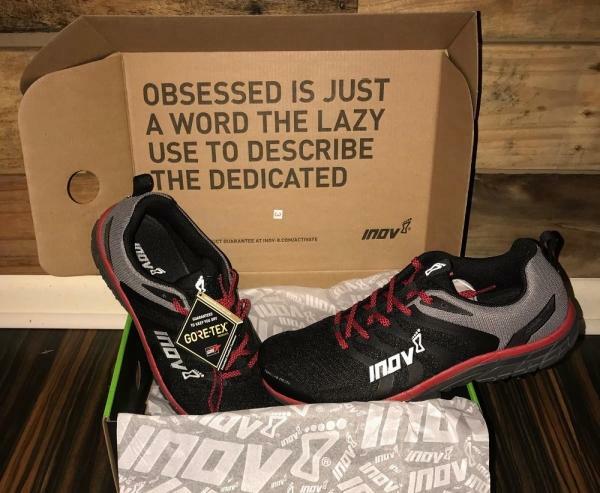 I am also a big fan of Parkruns so when Inov-8 announced they were making a shoe for running to the park, around the park and back again, I was definitely intrigued and could not wait to see if they could live up to my expectations. I was lucky enough to be sent a pair by Inov-8 to test but I have tried not to let that affect my opinion of them. Despite being the happy owner of many running shoes the idea of a do everything shoe is too good to resist. Could the Parkclaws really be that shoe? 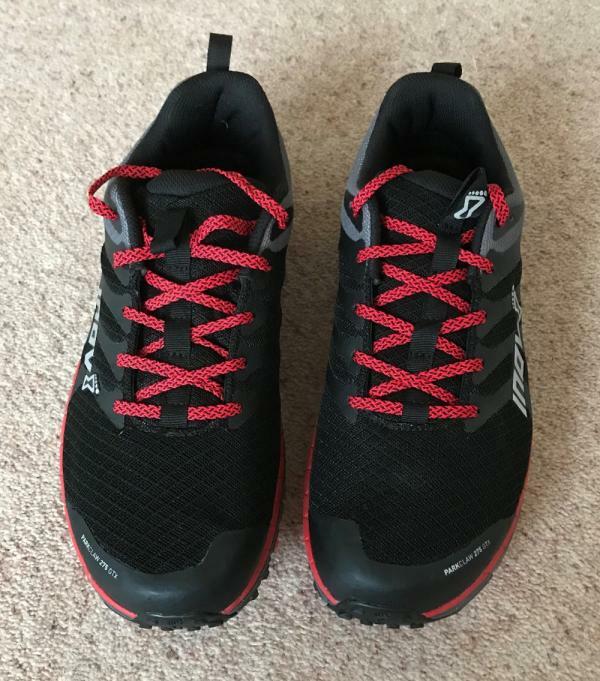 The design here is very similar to the Inov-8 Trail Talon 275s as you can see from the picture below (Parkclaws are on the left). This is absolutely no bad thing as the Trail Talon is a comfortable, relaxed looking shoe that fits straight out of the box so I am not surprised that Inov-8 have stuck with the design. The Parkclaws have a broad synthetic mesh upper with excellent protection around the toe and heel. The collar and tongue are thick and well-padded with a thick, chunky sole underneath. There are tabs on the heel and tongue to help getting the shoes on and off but the tongue tab did get in the way a bit when tying the laces. A small thing which probably tells you how good I think these shoes are. The upper is made of a single piece of lightweight mesh which is flexible and easy to clean. The chunky look and feel mean they could just as easily pass for a lightweight hiking shoe as a trainer and you could happily wear them casually all day as well as running in them. There is lots of padding around the tongue and collar which makes the Parkclaws comfortable straightaway. These are one of the most comfortable shoes I have ever tried, almost slipper like. The upper is wide and the toe box is very roomy meaning your feet have plenty of room to swell and they never feel tight or constricting. They are true to size and the 10.5s that I wear in pretty much all running shoes were fine. The laces and eyeholes are excellent. The laces grip well and the holes provide plenty of adjustment options meaning your feet remain secure with no slipping or rubbing even though they never feel tight. The laces have a rough texture that means once tied there is no chance of them coming undone. The Parkclaws feel light and soft with the cushioning obvious when you put them on. They feel quite wide compared to a road shoe but also robust and secure and I expect them to last well. They do not feel snug and your feet never feel squashed or restricted which is good. However, if you like your feet to be cosseted and hugged by a shoe you won’t get that with the Parkclaws. The Goretex membrane means they are cosy in the cooler months but they I don’t expect them to feel too hot when the temperature rises though I have only tried them in cooler conditions so far. The Parkclaws are not particularly flexible but that adds to the feeling of robustness and strength and gives me the confidence to carry on when I might have turned back in something less substantial. My feet always felt planted on the ground and I was never worried about slipping or turning an ankle. I have run with the Parkclaws on the road to reach a trail and they felt fine. The Powerflow midsole gave plenty of cushioning and energy return on the road and once you get off road they carry on quite happily. The grip is good on packed trails and grass but I will stick to the TrailTalons or Mudclaws when it gets muddy as the lugs on the Parkclaws are not that deep. Coupled with excellent Goretex membrane they are great for running through damp grass and do feel properly waterproof. The sole of the Parkclaws is not that different to a sturdy road shoe such as the Mizuno Wave Inspire or Asics GT-2000. The lugs are a little deeper as befits something that is going to tackle more trails but the shape of the sole overall is like a road shoe. The lugs are well spaced around the perimeter of the shoe and early impressions suggest they should be fairly durable. More suited to packed trails and grass than muddy or rocky routes, grip levels are good providing plenty of confidence when changing direction. The midsole provides lots of cushioning so the Parkclaws feel very soft and cushioned and I would be happy to go long distances in them. Compared to the Trail Talons the lugs are smaller and closer packed which is what I would expect for a shoe designed to tackle pavements on the way to trails. There is also less protection underneath on the Parkclaws but on the few runs I have done so far this has not been a problem due to the thickness of the midsole. The Parkclaws, though not heavy or cumbersome, are more about comfort and long distance than all out speed. They are well cushioned but don’t feel fast and nimble but then that is not really their point. They would be ideal for longer trail runs, up to half marathon and beyond but if I was looking for a 5k or 10k trail PB I would go for a Terraclaw or Trail Talon 235 instead as they give a lighter feel and a better idea of what is going on beneath your feet. However, for running all day on a variety of terrains the Parkclaws would be hard to beat. I have run a Parkrun and a few 5 to 10k training runs in the Parkclaws so far and the cushioning and grip has been excellent. No tired or aching feet here. The Parkclaws are like a pared down version of the TrailTalons. The uppers are almost identical but underneath the Parkclaws have more cushioning and a bit less grip making them ideal for running on the road to do some light trail running. They are also ideal for park running where the terrain changes regularly or on longer runs where you know the surfaces will be changing. The Goretex membrane works well at keeping the water out without feeling too warm. I have only tried them in autumn and winter so may need the non-Goretex version for when the temperature rises. But at the moment, when it is damp and chilly, they are perfect. There is no doubt the Parkclaws are an expensive shoe but I feel like you are getting more than one pair of shoes. If I could only take one running shoe on holiday I would take the Parkclaws. They can cope with pretty much all terrains for running, can cope with a hike and are stylish enough to wear casually as well. The quest for one shoe fits all just got a little bit closer. I am grateful to Inov-8 for sending me the Parkclaws to test. Parkclaw 275 GTX - a multi-terrain killer! 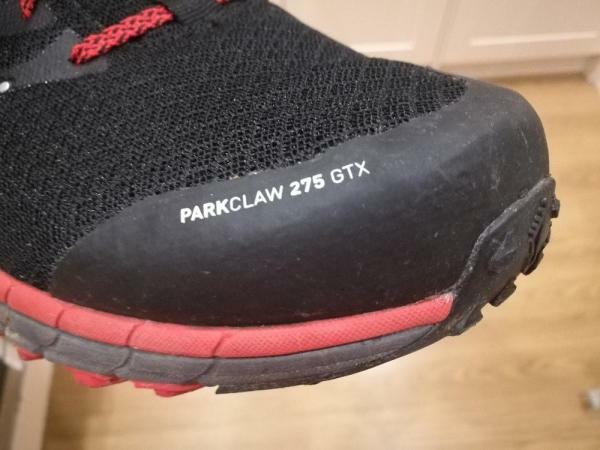 Inov-8 claims the Parkclaw 275 GTX to be some sort of all-rounder and they’re not lying! Out of the three pairs of trail shoes I’ve been testing (the other two being the Inov-8 Trailtalon 290 and the Vivobarefoot Primus Trail FG) these come out on top in almost every area and on every terrain. I’ve hit hard and soft trails, groomed tracks, rough and smooth pavements, wet sand, dry sand and every form of mud I could find. They demolished the lot! I particularly enjoyed running along the beach with the sea lapping my feet when I was testing the GORE-TEX® bonded upper. I have to say that at first, I quite liked the styling of the Parkclaws, but over time I'm not too sure anymore. They're not too flashy and the red accents them nicely but I definitely couldn't wear them all the time. That's not to say they're ugly trainers but they're not really for me. As you can see from the tech specs above there's a fair bit going on with these shoes. They have an 8mm drop, which is far too much for me as a mid to forefoot striker. It means I have to really overcompensate when I shouldn't need to. After all, if I was meant to have a slope on my feet they surely would have evolved to have that, right? (Just my personal opinion on this and I won't go into it too much today). Anyway… that aside the sole/midsole combination work really well in terms of performance, I have no idea what DFB means so we'll skip that one for now but on the Inov-8 website they help to give some information on the Powerflow+ technology which they claim delivers 10% better shock absorption and 25% better energy return than standard midsoles. I actually think this might not just be sales bluster because for me the energy return the Parkclaw 275 GTX offer is fantastic, even when compared with their own Trailtalon 290 which seems to have a similarly named sole technology. It just doesn't work anywhere near as well. The upper is a Gore-tex membrane that's been bonded directly to the upper fabric (which I have no idea what it actually is). Inov-8 claim that this eliminates wrinkles and folds in the upper, so pressure points and blisters are significantly reduced and freedom of movement and flexibility is increased. I definitely do not agree, (see flexibility section below!) and I think the need for waterproof trainers might be a bit more of a niche market. I for one regret choosing them over their non-waterproof variant. There aren't a tonne of safety features to talk about here, though the ones worth mentioning are the durable upper with additional toe bumper, which seems to be some sort of rubber layer. It works sufficiently, at least I've never suffered any toe stub pain as yet. The tongue is also webbed so debris and/or wildlife (horses, rabbits, tigers… you know the sort) will find it very hard to work their way inside to cause any discomfort whilst running. 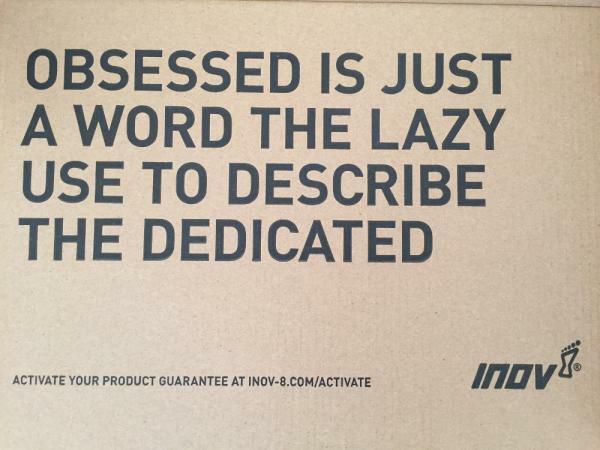 Or the lack thereof… These all-rounders from Inov-8 are so inflexible it’s crazy. For some people, this might be great but for me, I need so much more from a trail shoe. It’s definitely the biggest downside of them. With the Gore-tex upper things are already stiff, add to that the thick, heavy sole with some form of flex-groove system that doesn't really seem to work that well and you’ve got a shoe that is decidedly rigid. It’s a shame as it definitely lets them down but you can’t win ‘em all I guess! The fit is secure and comfortable. My feet feel very snug in them, including in the toe-box which is too tight for me and over longer runs gets less and less comfortable. The inner and tongue are very padded and although initially comfortable I'm not sure it's all necessary. I don't really mind it all that much but I think the toe box especially could have done with more room to it, or perhaps been a different shape altogether. The lacing system is fine, nothing to write home about but it works and I can't mark it down at all. There's no hiding from it the sole on the Parkclaw 275 GTX is going to wear out fast. The lugs are wearing a lot already after only 60 or so miles as they're quite a soft rubber. Though a lot of my miles have been on the road I still can't see these lasting much past the 300-mile point before there's only enough grip for road only running. That said, the grip is pretty great though and it hasn't let me down on any surface as yet. I was able to hit the road and stuck to it like glue in all weather conditions. The same can be said for hard and soft trails, wet grass, sticky mud, rocky tracks, gravel paths, wet sand, dry sand and everything else in between! I really cannot stress how good this shoe is as an all-rounder! The Parkclaw 275 GTX has a great heel cup! Once laced in my feet were locked in really well. There's a tad too much arch support for my liking which other people used to minimalist shoes may find intrusive, however, it's not as high an arch as some trainers and isn't unbearable by any means. The Gore-tex water-proofing is a nice idea but I'm not really sure how much it improves this offering from Inov-8. It makes them feel quite tight, restrictive and much less flexible then they ought to be; and with deep-ish puddles or mud, water still gets in the shoe over the top and they don't drain so well. It only really works to keep your feet dry with shallow puddles or running through surface water but even then if any splashes over the top it's in there. It's a novel idea but I wish I'd gone for the non GTX (waterproof) version as I think those would probably be lighter and more flexible and I don't really mind if my feet get wet every now and then. The Trailtalon 290 is a good example of how the upper would have been better than the one on this shoe. Negatives aside these shoes perform incredibly well. Especially considering their weight (and the fact that I'm used to running about in Vivobarefoot Stealth 2 and Vibram FiveFingers KSO Evo )! As I mentioned in the grip segment they ate up every surface I could throw at them. I even managed a 10 mile PR in them in the midst of my 'Run Every Day January’ challenge, something I did not expect to happen! The following week I smashed a half marathon in them! If the Parkclaw 275 GTX’s had the upper from the Trailtalon 290 (see review here) with the zero drop and toe room of a barefoot shoe like the Primus Trail FG (see review here) I would never ever take them off. They come very close to being an incredible shoe and are currently my go-to shoe for anything off-road. While it is primarily a trail running shoe, the Inov-8 Parkclaw 275 GTX is designed to be versatile; it delivers a solid performance on the trail, yet also offers sufficient cushioning to take the runner from home to trail and back. The shoe is ideal to use in fast-paced runs, as well as slower recovery runs. The shoe prides itself as one of the first to use the Gore-Tex® Invisible Fit, ensuring the upper stays waterproof. This recent technology delivers a structure that is lighter and more flexible than before. Meanwhile, the POWERFLOW+ midsole of the Parkclaw 275 GTX is perfect for heel strikers, thanks to its 8-mm drop. It has an improved structure that delivers 10% better shock absorption and 25% better energy than traditional midsoles. It sits on an aggressive Tri-C outsole that is relatively noticeable on wet rock or tarmac. The GTX version of the Inov-8 Parkclaw 275 is built to fit true to size, as it follows the standard length of running shoes. The shape of the shoe is broad in the forefoot, to promote a natural and comfortable toe splay, and slightly narrower towards the heel, to secure the foot in place. The shoe is designed as a unisex running shoe while following men’s sizes. Inov-8 classifies the Parkclaw 275 GTX under their Fit Scale as a “5,” which is roughly equivalent to the 2E – Wide profile running shoe. A triple-compound rubber, aptly called Tri-C by Inov-8, is used as the outsole of the Parkclaw 275 GTX. This material is comprised of three types of rubber to give the shoe all-around, no-fail protection and traction. In the midfoot and arch areas is a soft rubber that provides a comfortable landing spot, the forefoot area has a flexible rubber that allows an effortless toe-off, and the heel region is covered with durable rubber that intends to resist wear and tear. A section of the forefoot has a set of Meta-Flex grooves, which enables a smooth bend and forward propulsion for a quicker and more powerful pace. The 4-mm deep lugs of the Parkclaw 275 GTX permit the runner to traverse snowy roads and muddy paths with minimum effort. These lugs are distributed widely and evenly across the outsole to reduce clogging. The POWERFLOW+ technology equips the Parkclaw 275 GTX with the most cushioned midsole among all of Inov-8’s running shoes. They provide the foot with a firm and responsive sensation that offer more ground feel. With the shock-absorbent capability of the POWERFLOW+, forward spring is achieved immediately. The cushioned midsole material also aims to protect the underfoot. The Dynamic Fascia Band (DFB) shank is a thermoplastic polyurethane plate that stretches across the length of the shoe. This element branches out to follow each metatarsal for natural responsiveness. The classic Inov-8 upper material levels up with the help of the Gore-Tex® Invisible Fit technology. This new detail integrates the Gore-Tex® waterproof membrane within the textile base of the running shoe. Aside from shielding the foot from water and wetness, the Gore-Tex® Invisible Fit offers more comprehensive protection during inclement weather, as well as a flexible fit that results in more natural movements. In addition to the features above, the unique structure of the Gore-Tex® Invisible Fit eliminates wrinkles and folds in the upper, therefore reducing blisters and hot spots. An external heel counter wraps the rearfoot portion of the shoe to provide adequate support in the heel. With this feature, the shoe is able to increase stability in foothold and maintain a better gait.